Parking Lot Line Painting: How Much Does It Cost? 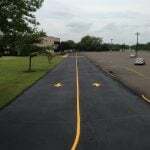 Regular parking lot line painting is beneficial and important for several reasons like; safety, maximization of space, curb appeal, and meeting ADA regulations. At a minimum, you should be re-striping your parking lot every other year. Since this maintenance task should be performed so regularly, it is important to understand and know its cost so you can properly budget. Budgeting properly and ahead of time as a manager of a commercial property is particularly important. 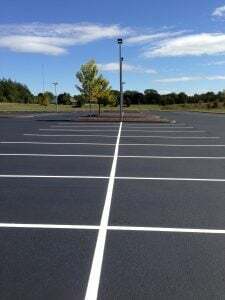 When it comes to parking lot line painting, pricing can work a few different ways and there are several things to consider. Parking lot line painting costs require a tallying of every single item that is to be painted; number of parking stalls, handicap accessible stalls, arrows, stop bars, speed bumps, fire lane, etc. Most companies will present your quote in the form of a lump sum, so not to overwhelm a property owner with a list of itemized pricing. Minimums – It is important to keep in mind that most contractors typically have a minimum service charge for smaller jobs (jobs that consist of less than 30-50 parking spaces). This minimum charge covers all the costs of mobilizing a crew and equipment to a smaller job. 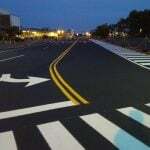 When working with professional companies, you can expect the minimum national average to be between $300-$500 for a simple re-painting job, and anywhere between $500-$700 for a new layout job, over new asphalt for example. Restripe Vs. New Layout – For any striping job, we will first need to consider if it is a restripe job, or a completely new layout. 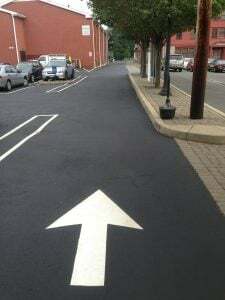 Are we laying out all new lines over freshly paved asphalt, or are we just re-painting a coat on lines that are already there? A restripe job will typically be cheaper than a new layout because, with a new layout we will have to factor in design time and layout of the new spaces and markings, which takes a considerable amount of time even with existing architectural or construction plans. This means our planning phase for a new layout, before we even begin our parking lot line painting, will be very time consuming. Number Of Pavement Markings – The number of pavement markings that are on the site will play a large role in your project cost. Pavement markings are everything other than stalls (arrows, handicap marking, number stencils, speed bumps, stop bars, no parking markings, etc.). Typically, about half of your line striping costs will be absorbed in pavement markings. A typical gas station is about 5,000 square feet and may take about 2 hours = about $300. A restaurant storefront like McDonald’s may be about 10,000 square feet and may require 2 trips at 2 hours each = about $600. A small shopping center with around 100,000 square feet will take around 6 hours (at night) = about $1000. A large commercial lot like a Home Depot can take anywhere from 10-20 hours = about $1500-$3000. 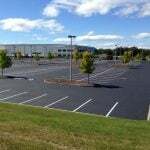 The Bottom Line – When all is said and done, speaking in terms of averages, the national average parking lot painting job will cost around $1100. 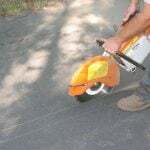 When planning your maintenance budget for the year, it is important to add line striping into your pavement maintenance list at least every other year! Fresh and easily identifiable parking lot paint is important for many reasons. The professionals at EastCoat Pavement can help you to put together a completely new layout after a fresh paving, or we can restripe existing lines and markings. Contact us today for your free consultation, and let us help you keep your lot fresh, safe, and within compliance!